ASTORIA — A new restaurant in the neighborhood is looking to redefine how locals enjoy Indian food, with a menu inspired by "grandma's kitchen in India" that will change seasonally, according to the owners. 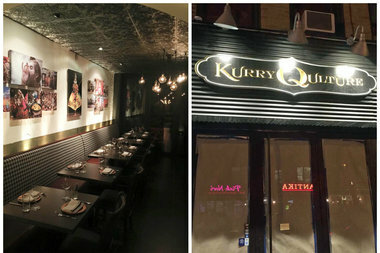 Kurry Qulture opened Saturday on 30th Avenue near 37th Street — in the space formerly occupied by Bourbon and Vine bar — that will offer something different than the buffets and traditional dishes that most people think of when it comes to Indian cuisine. "Indian food is so much more than just curry or chicken tikka masala," said Vanessa Solomon, who is opening the restaurant with husband and restaurant industry veteran husband Sonny Solomon. He's worked as a manager at fine dining restaurants for more than a decade, including at Devi — the first Indian restaurant in the country to earn a Michelin star — and Midtown eatery Tulsi. "He's worked so hard learning the business from the bottom up," said Vanessa Solomon. "We're really excited." The menu was conceived by acclaimed chef Hemant Mathur, a friend and former colleague of Sonny Solomon's, and will be based around produce and other in-season ingredients that will change throughout the year. "We want to keep the menu fresh," Vanessa Solomon said. "We want to keep people excited about the food and be able to taste new flavors." Their current winter menu includes vegetarian options like sweet potato chaat, inspired by a popular street vendor food in India, which is served extra crispy and topped with sweet spices and salt, according to Solomon. Other dishes include apricot and chicken shish kabobs flavored with fennel and coriander, or a curry dish made with turnip and goat that's inspired by Indian homecooking. "What pulls it together is this element of seasonal produce," Solomon said. She and her husband have lived in Astoria for years, where they are raising their two children. She said they want to restaurant to incorporate the elements of Sonny's fine dining experience but in a casual atmosphere. "We wanted diners to experience all the element of fine dining but without the pretentiousness," she said. The restaurant also has a full bar, with a selection of cocktails, wine and beer on tap. It's currently open for dinner service seven days a week from 5 p.m. to 10 p.m.